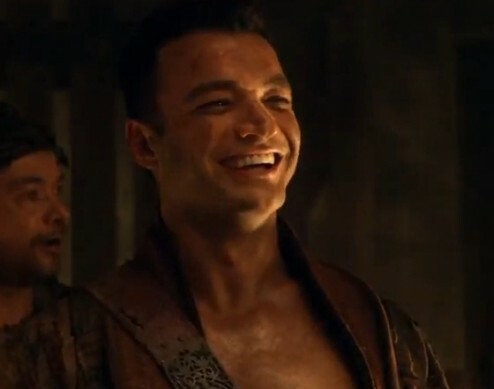 Another minor character bites the dust, Spartacus does some moralizing, and more fun with Lucretia and Ashur. There are times when I think that Spartacus Vengeance specializes in setting the stage without ever raising the curtain. The writers have this unique talent for focusing on the movement of pawns around the board. Higher point pieces end up within striking distance, but more often than not seem to back down rather than press advantage. I am so bored with watching pawns fall at the expense of playing out a more risky gambit. Episode 8 “Balance” had it within its power to give the audience an event that would have rivaled the burning of the arena. Instead it just saw one more pointless piece removed from play. The entirety of the episode focuses on one question: Will Spartacus kill Ilithyia? Gannicus, having brought the Praetor’s wife to the rebel camp, offers Ilithyia’s life as a means of balancing vengeance between Glaber and Spartacus. In his mind, Ilithyia’s death will put the rebellion to rest and allow some semblance of order to return. For all of Spartacus’ talk there’s no real doubt that he’ll let Ilithyia live. In fact, everything that goes on within the rebel camp comes across as telegraphed in advance. I’ve suspected that Ilithyia’s baby is actually Spartacus’ ever since her first scene of the season – why else would she have fantasies about their tryst in the ludus? In similar fashion, anyone with an eye for the obvious would have seen Mira’s attempt on Ilithyia’s life coming a mile away as it had all the subtlety of a Roman cavalry charge. Despite shallow writing, credit must be given to Liam McIntyre and Katrina Law’s performance during those scenes. After cutting short Mira’s attempt to strangle the life out of Ilithyia, Spartacus callously informs Mira that she does not know his heart. Law’s expression conveys agony bordering on betrayal as McIntyre finally gets a chance to act. In Capua, Glaber is working damage control. Knowing full well that he will become a laughing stock in the Senate if word of Ilithyia’s abduction makes it to Rome, the Praetor institutes a media blackout. Instead of deploying his troops to the countryside, he sends Ashur and his goons to the local brothel in search of information. The scene that follows blends the best of computer and visual effects into one giant bloody mess. Something worth noticing in Glaber’s plan speaks to the relationship between Lucretia and Ilithyia. For the longest time I thought that Lucretia was running a con against the Praetor’s wife. In light of Glaber’s half-hearted interest in recovering Ilithyia, Lucretia’s concern for her lost friend struck as genuine. Perhaps I’ve had it wrong all this time and she actually is clinging on to Ilithyia as a last vestige of support. It is not a good thing when Ashur smiles. Ashur returns to the villa without having found any lead upon Gannicus’ whereabouts. Naturally that means it’s time to pay a visit to his “beloved” Lucretia. The course of this degradation session, where once again Lawless and Tarabay are in top form, yields some essential reversal of fortune for the former domina. Upon being shoved to the floor, Lucretia topples Ashur’s chest of ill gotten goods. From within spills the bracelet of dead Seppius. At last, Lucretia finds a much needed (and not at all convenient) piece of leverage. Meanwhile back in the telegraph office rebel camp, Ilithyia recognizes Lucius as a Roman citizen. With precious little encouragement the latter admits to the former that his state of affairs is due to Sulla seizing his family’s holdings. Therein Ilithyia offers a bargain; if Lucius gets word to Glaber of the rebel camp’s location, all his assets will be restored. For a moment, I almost believed that Lucius might sell out the rebels. Then Spartacus called him away for an off-camera wisdom walk and I knew the game was afoot. Lucius’ arrival in Capua only confirmed my suspicion. Rather than play out a believable gambit, Lucius took to insulting the Praetor as he delivered Spartacus demands: one, a wagon full of weapons for the life of Ilithyia and two, the deal goes down in-person between Glaber and Spartacus. Once again, a person would have to be blind, deaf, and in possession of the cognitive faculties of an undomesticated possum not to expect that “wagon full of weapons” to be filled with Ashur and his goons. The ensuing battle, which at least Spartacus seems to have anticipated, sees Lucius get killed for no particular reason other than he didn’t feel like running away. Glaber took an arrow through the shoulder, but it was a mere flesh wound. Wait what? There’s no such thing as just a flesh wound when it comes to arrows, especially when they hit joints. For all the plotting and counter-plotting, the episode’s last five minutes see the only significant story development. Lucretia confronts Seppia, who has been reveling in hubris as she takes to the Praetor’s bed in Ilithyia’s absence, with Seppius’ bracelet. Spartacus releases Ilithyia but only after some soft spoken yet utterly cruel lines about how Glaber, who valued capturing Spartacus more than recovering the mother of his child, doesn’t love Ilithyia as Spartacus loved his dead wife. Glaber and Seppia have a bath together wherein the Praetor recounts how the gods must have taken Seppius and Ilithyia to bring the two of them together. Here’s what worries me: History tells us that a Roman Praetor named Gaius Claudius Glaber led 3,000 legionaries against Spartacus and his band of rebel gladiators at the foot of Mount Vesuvius. The slave army was able to route the Romans, and thus became worthy of Pompey and Crassus’ attention. I don’t see how this season could possibly end with that battle if there are only two more episodes left. What seems infinitely more likely is that Glaber is going to get the Julius Caesar treatment from Seppia and Ilithyia. Snore. Characters positioned in order of importance, sigh. On a positive note, Oenomaus got a few more lines than he did last week. Even though most of them were spent mulling over the fidelities of his dead wife, it is a pleasure to watch Peter Mensah work. I’m also softening on my previous “Kill Gannicus” position. He’s no Agron and he’s defiantly no Varro, but his whinging has given way to a greater depth of character. He knows that challenging Rome is futile. Yet he follows Spartacus because he believes that fighting for this cause might balance the impossible debt he owes Oenomaus. In a group full of idealists, Gannicus is the only realist. I thought neither actor nor character capable of pulling off such a layered performance. Crixus and Naevia constitute the final surprise of the episode. In a more action focused story this segment would have likely ended up on the cutting room floor. Instead, the audience saw Naevia taking to swordplay as a means of reclaiming what was taken during her various assaults. To my eyes, that little vignette seemed rather empowering, perhaps more so than Mira’s newfound Artemis vibe. So there we have it. Another episode down and what have we to show for our troubles? The rebels are no closer to being combat ready than they were last week. Glaber seems more likely to take a knife in the back from a jilted lover than from Spartacus. And whatever long con Lucretia might have been running has taken a back seat to getting debased by Ashur. For all its potential, the stakes just don’t feel particularly high right now. I am waiting for you to uolpad this episode. Thanks for the other uolpads. May Gods bless you. I don’t like how they changed Naevia with this new actor. According to me she is not that great of a actor. But any ways. We will miss you Andy Whitfield. I was watching the first season and to be honest new Spartacus do not stand any where near Andy.